The composite restoration is the basic foundation of the general dental practice. Countless composites are placed by dentists every day. Through the science of adhesive dentistry, these restorations can be conservative and provide longterm service. 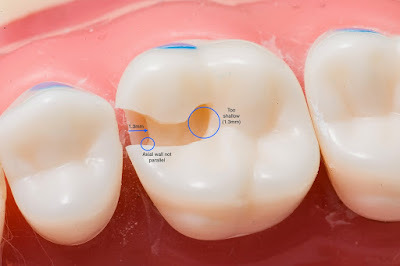 With time and function some breakdown may occur, usually at the margin of the re storation, the interface between the tooth structure and composite resin. In many cases, while the margin shows localised breakdown, the rest of the re storation remains intact. The dentist is then faced with the decision of replacing or repairing the restoration. In the days before adhesive dentistry, when an amalgam margin began to break down, the entire restoration was soon compromised. There was no tooth–amalgam bond or seal to prevent the leakage and percolation of saliva, bacteria and bacterial products into the area under the amalgam and the adjacent tooth structure. This environment allowed bacteria to thrive, creating further breakdown and secondary caries. With the advent of adhesive dentistry, leakage is no longer a major concern. Even in situations where the restorative margin has become defective, the bulk of the restoration is still sealed against bacterial challenge. It is, however, important not to leave these margins open over the long term. With time, there can be further marginal breakdown and secondary decay around the perimeter of the restoration. The dentist should not leave the restoration until it becomes unsalvageable and must be replaced entirely. With today’s technology and materials, there are tools to address the situation proactively at an early stage, before more extensive treatment becomes necessary. This approach is the perimeter preparation. What tools are needed to repair and restore the defective margins of a composite resin restoration? First, there must be an excisional instrument (bur) that is conservative and minimally invasive. This bur should access marginal decay with minimal tooth removal. Second, the restorative material must flow easily into all the irregularities of the perimeter preparation. The typical preparation is very narrow. It may also be long and convoluted, following the defects at the margins of the restoration and the surrounding tooth. The dental material of choice is a flowable composite resin, which can easily pen – etrate the intricate geometry of the narrow preparation without bubbles or gaps. The ideal material should have strength and wear resistance to withstand all oral forces. It must be radiopaque to allow for monitoring of treated sites. Additional features to this ultimate wish list are plaque resistance and remineralising properties, to prevent future perimeter breakdown. The ultimate wish list is no longer dental science fiction. These tools, materials and techniques are available, as discussed below. The Fissurotomy Bur system (SS White Burs) was developed to detect and remove incipient decay in enamel proactively. The shape and size of the Fissurotomy Bur are designed specifically for treating early pit and fissure lesions. The head length is 2.5 mm, allowing the dentist to control the bur tip to cut just below the amelodentinal junction and no further. The tapered shape of the bur allows the cutting tip to encounter very few dentinal tubules, and to minimise heat build-up and vibration. This has the added advantage of decreasing patient discomfort and the need for local aesthetic. Traditional cutting burs remove far more enamel at any depth of cut and are far more invasive. The Fissurotomy Bur is the ideal excisional tool for the perimeter preparation. It is conservative and minimally invasive. It can access decay with little tooth removal. The Fissurotomy Bur is the proactive tool for the repair of defective composite restoration margins. Giomers (Beautifil II and Beautifil Flow Plus, both SHOFU) are the latest category of hybrid restorative materials. Giomer technology represents the true integration of glass ionomers and composite resins with the benefits of both. Giomers provide the fluoride release and recharge of glass ionomers, and the aesthetics, physical properties and handling of composite resins. Studies have demonstrated that dentine remineralisation occurs at the preparation surface adjacent to the giomer. Furthermore, giomer restorations take up the extra fluoride ions released by fluoride toothpastes, rinses and varnishes in oral fluids. The giomer restorations then function as reservoirs when fluoride is needed in the oral cavity. Giomer restorations resist plaque formation owing to a film that forms on the restorative surface when it contacts saliva. This film consists of aluminium, silica, strontium and other ions that originate from the giomer fillers and act to inhibit bacterial adhesion. A giomer flowable (Beautifil Flow Plus) has recently been introduced. It combines all the healing advantages of giomer science with the ease of use, handling and adaptability of flowable composites. The physical performance (compressive strength, wear resistance, etc.) of Beautifil Flow Plus has been tested against leading hybrid composites and has been found to be equal or better. In addition, Beautifil Flow Plus is radiopaque. Beautifil Flow Plus is the ideal restorative material for the perimeter preparation. It fulfils all the necessary criteria: a flowable composite resin that easily conforms to the intricate geometry of the narrow preparation without creating voids, has strength and wear resistance to withstand oral forces, is bacteriostatic and remineralising to prevent secondary caries, and is radiopaque. The tools and materials for the perimeter preparation are now readily available and so is the simple technique that can be incorporated into daily dental practice. The occlusal margins of a composite restoration have begun to break down. There is no radiographic evidence that decay has spread far beyond the surface. All decay and questionable tooth material are removed with the Fissurotomy Bur. The perimeter preparation is examined for any remaining decay. Micro-abrasion can be used to increase the surface roughness and bondability of the preparation. Shofu BeautiBond the seventh-generation ad – hesive is applied to the cavity preparation. The adhesive is thoroughly air dried. A brief three to five seconds of LED light curing is all that is required for the adhesive. Beautifil Flow Plus is placed in the perimeter preparation and light cured. The completed perimeter preparation technique offers a restoration that will serve the patient effectively for many years. The perimeter preparation is an effective treatment option for proactive intervention dentistry. The dentist has the tools, materials and techniques to manage restorative marginal breakdown at an early stage, before more extensive treatment becomes necessary. This is simpler and more predictable for the dentist, as well as more comfortable and less invasive for the patient.